Their manner of careynge ther Childern and atyere of the cheiffe Ladyes of the towne of Dasamonquepeuc. IN the towne of Dasemonquepeuc distant from Roanoac 4. or 5. milles, the woemen are attired, and pownced, in suche sorte as the woemen of Roanoac are, yet they weare noe wreathes uppon their heads, nether have they their thighes painted with small pricks. They have a strange manner of bearing their children, and quite contrarie to ours. 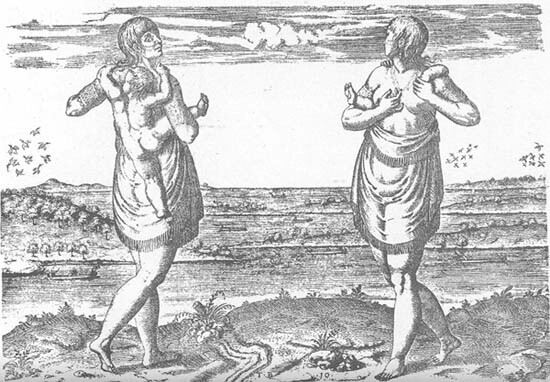 For our woemen carrie their children in their armes before their brests, but they taking their sonne by the right hand, bear him on their backs, holdinge the left thighe in their lefte arme after a strange, and unuseuall fashion, as in the picture is to bee seene.. Their seetheynge of their meate in earthen pottes. 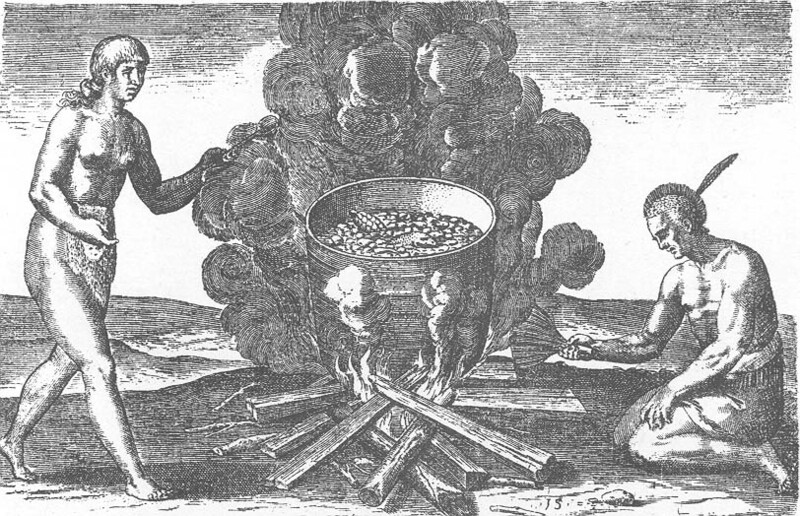 THEIR woemen know how to make earthen vessells with special Cunninge and that so large and fine, that our potters with lhoye wheles can make noe better: ant then Remove them from place to place as easelye as we can doe our brassen kettles. After they have set them uppon an heape of erthe to stay them from fallinge, they putt wood under which being kyndled one of them taketh great care that the fyre burne equallye Rounde abowt. They or their woemen fill the vessel with water, and then putt they in fruite, flesh, and fish, and lett all boyle together like a galliemaufrye, which the Spaniarde call, olla podrida. Then they putte yt out into disches, and sett before the companye, and then they make good cheere together. Yet are they moderate in their eatinge wherby they avoide sicknes. I would to god wee would followe their exemple. For wee should bee free from many kyndes of diseasyes which wee fall into by sumptwous and unseasonable banketts, continuallye devisinge new sawces, and provocation of gluttonnye to satisfie our unsatiable appetite. THEIR manner of feeding is in this wise. They lay a matt made of bents one the grownde and sett their meate on the mids therof, and then sit downe Rownde, the men uppon one side, and the woemen on the other. Their meate is Mayz sodden, in suche sorte as I described yt in the former treatise of verye good taste, deers flesche, or of some other beaste, and fishe. They are verye sober in their eatinge, and drinkinge, and consequentlye verye longe lived because they doe not oppress nature. ALTHOUGH (frendlye Reader) man by his disobedience, weare deprived of those good Gifts wher with he was indued in his creation, yet he was not berefte of wit to provyde for hym selfe, nor discretion to devise things necessarie for his use, except suche as appartayne to his soules healthe, as may be gathered by his savage nations, of whome this present worke intreateth. For although they have noe true knoledge of God nor of his holye worde and are destituted of all lerninge, Yet they passe us in many thinges, as in Sober feedinge and Dexteritye of witte, in makinge without any instrument of mettall thinges so neate and so fine, as a man would scarselye beleve the same, Unless the Englishemen Had made proofe Therof by their travailes into the contrye. Consideringe, Therfore that yt was a thinge worthie of admiration, I was verye willinge to offer unto you the true Pictures of those people wich by the helpe of Maister Richard Hakluyt of Oxford Minister of Gods Word, who first Incouraged me to publish the Worke, I creaved out of the verye original of Maister Ihon White an Englisch paynter who was sent into the contrye by the queenes Majestye, onlye to draw the description of the place, lyvely to describe the shapes of the Inhabitants their apparell, manners of Livinge, and fashions, att the speciall Charges of the worthy knighte, Sir WALTER RALEGH , who bestowed noe Small Sume of monnye in the serche and Discoverye of that countrye, From the yeere, 1584, to the ende of The yeare 1588. Morover this booke which intreateth of that parte of the new World which the Englishemen call by the name of Virginia I heer sett out in the first place, beinge therunto requested of my Frends, by Reason of the memorye of the fresh and late performance therof, albeyt I have in hand the Historye of Florida wich should bee first sett foorthe because yt was discovured by the Frencheman longe befor the discoverye of Virginia, yet I hope shortlye also to publish the same, A Victorye, doubtless so Rare, as I thinke the like hath not ben heard nor seene. I craeved both of them at London, and brought Them hither to Franckfurt, wher I and my sonnes haven taken ernest paynes in gravinge the pictures ther of in Copper, seeing yt is a matter of noe small importance. Touchinge the stile of both the Discourses, I have caused yt to bee Reduced into verye Good Frenche and Latin by the aide of verye worshipfull frend of myne. Finallye I hartlye Request thee, that yf any seeke to Contrefaict thes my bookx, (for in this dayes many are so malicious that they seeke to gayne by other men labours ) thow wouldest give noe credit unto suche conterfaited Drawghte. For dyvers secret marks lye hiddin in my pictures, which wil breede Confusion unless they bee well observed. The arrival of the Englishemen in Virginia. The sea coasts of Virginia arre full of Ilands, wher by the entrance into the mayne lãd is hard to finde. For although they bee separated with divers and sundrie large Division, which seeme to yeeld convenient entrance, yet to our great perill we proved that they wear shallowe, and full of dangerous flatts, and could never perce opp into the mayne land, untill wee made trialls in many places with or small pinness. At lengthe wee fownd an entrance uppon our mens diligent serche therof. Affter that wee had passed opp, and sayled ther in for a short space we discovered a mightye river fallinge downe in to the sownde over against those Ilands, which nevertheless wee could not saile opp any thinge far by Reason of the shallewness, the mouth ther of beinge annoyed with sands driven in with the tyde therfore saylinge further, wee came unto a Good bigg yland, the Inhabitants therof as soone as they saw us began to make a great and horrible crye, as people which never befoer had seene men apparelled like us, and camme a way makinge out crys like wild beasts or men out of their wyts. But beeng gentlye called backe, wee offred them of our wares, as glasses, knives, babies, and other trifles, which wee thougt they deligted in. Soe they stood still, and percevinge our Good will and courtesie came fawninge uppon us, and bade us welcome. Then they brougt us to their village in the iland called, Roanoac, and unto their Weroans or Prince, which entertained us with Reasonable curtesie, althoug they wear amased at the first sight of us. Suche was our arrivall into the parte of the world, which we call Virginia, the stature of bodye of wich people, theyr attire, and maneer of lyvinge, their feasts, and banketts, I will particullerlye declare unto yow. THE townes of this contrie are in a maner like unto those which are in Florida, yet are they not soe stronge nor yet preserved with soe great care. They are compassed abowt with poles starcke faste in the grownd, but they are not verye stronge. The entrance is verye narrowe as may be seene by this picture, which is made accordinge to the forme of the towne of Pomeiooc. Ther are but few howses therin, save those which belonge to the kinge and his nobles. On the one side is their tempel separated from the other howses, and marked with the letter A. yt is builded rownde, and covered with skynne matts, and as yt wear compassed abowt with cortynes without windowes, and hath noe lighte but by the doore. On the other side is the kings lodginge marked with the letter B. Their dwellinges are builded with certaine potes fastened together, and covered with matts which they turne op as high as they thinke good, and soe receve in the lighte and other. Some are also covered with boughes of trees, as every man lusteth or liketh best. They keepe their feasts and make good cheer together in the midds of the towne as yt is described in the 17. Figure. When the towne standeth fare from the water they digg a great ponde noted with the letter C wherhence they fetche as muche water as they neede. THEIR townes that are not inclosed with poles are commonlye fayrer then suche as are inclosed, as appereth in this figure which livelye expresseth the towne of Secotam. For the howses are Scattered heer and ther, and they have gardein expressed by the letter E. They have also groaves wherin thei take deer, and fields wherin they sowe their corne. In their cornefields they builde as yt weare a scaffolde wher on they sett a cottage like to a rownde chaire, signiffied by F. wherin they place one to watche, for there are suche nomber of fowles, and beasts, that unless they keepe the better watche, they would soone devoure all their corne. For which cause the watcheman maketh continual cryes and noyse. They sowe their corne with a certaine distance noted by H. other wise one stalke would choke the growthe of another and the corne would not come unto his rypenes G. For the leaves therof are large, like unto the leaves of great reedes. They have also a severall broade plotte C. whear they meete with their neighbours, to celebrate their cheefe solemne feastes as the 18. picture doth declare: and a place D. whear after they have ended their feaste they make merrie togither. Over against this place they have a rownd plott B. wher they assemble themselves to make their solemne prayers. Not far from which place ther is a lardge buildinge A. wherin are the tombes of their kings and princes, as will appere by the 22. figure likewise they have garden notted bey the letter I. wherin they use to sowe pompions. Also a place marked with K. wherin the make a fyre att their solemne feasts, and hard without the towne a river L. from whence they fetche their water. This people therfore voyde of all covetousnes lyve cherfullye and att their harts ease. Truth of 1st Thanksgiving, by Professor James Loewen, author "Lies My Teacher Told Me"
Over the last few years, I have asked hundreds of college students, "When was the country we now know as the United States first settled?" That is a generous way of putting the question. Surely "we now know as" implies that the original settlement happened before the United States. I had hoped that students would suggest 30,000 BC, or some other pre-Columbian date. They did not. Their consensus answer was "1620." Part of the problem is the word "settle." "Settlers" were white. Indians did not settle. Nor are students the only people misled by "settle." One recent Thanksgiving weekend, I listened as a guide at the Statue of Liberty told about European immigrants "populating a wild East Coast." As we shall see, however, if Indians had not already settled New England, Europeans would have had a much tougher job of it. Starting with the Pilgrims not only leaves out the Indians, but also the Spanish. In the summer of 1526, 500 Spaniards and 100 black slaves founded a town near the mouth of the Pedee River in what is now South Carolina. Disease and disputes with nearby Indians caused many deaths. Finally, in November the slaves rebelled, killed some of their masters, and escaped to the Indians. By now only 150 Spaniards survived, and they evacuated back to Haiti. The ex-slaves remained behind. So the first non-Native settlers in "the country we now know as the United States" were Africans. 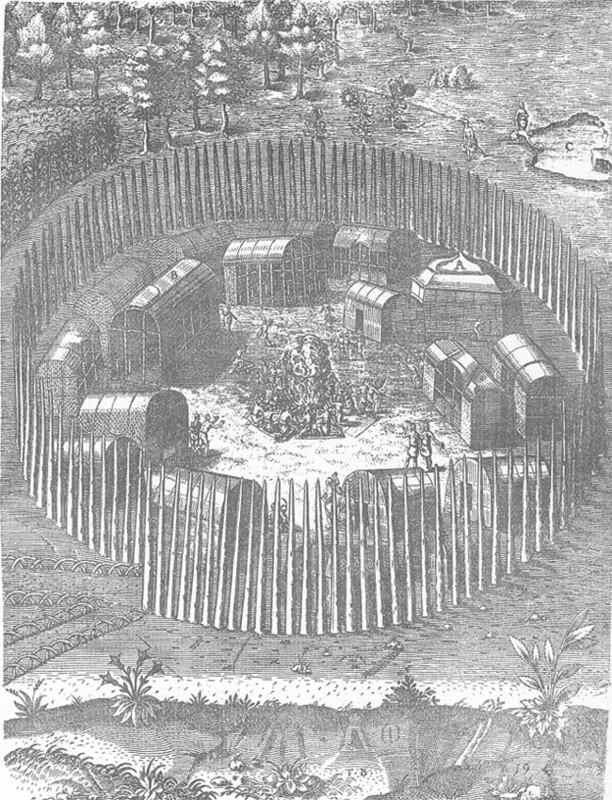 The Spanish continued their settling in 1565, when they massacred a settlement of French Protestants at St. Augustine, Florida, and replaced it with their own fort. Some Spanish were pilgrims, seeking regions new to them to secure religious liberty: these were Spanish Jews, who settled in New Mexico in the late 1500s. Few Americans know that 1/3 of the United States, from San Francisco to Arkansas to Natchez to Florida, has been Spanish longer than it has been "American." Moreover, Spanish culture left an indelible impact on the West. The Spanish introduced (imported) horses, cattle, sheep, pigs, and the basic elements of cowboy culture, including its vocabulary: mustang, bronco, rodeo, lariat, and so on. After some exploring, the Pilgrims chose the land around Plymouth Harbor for their settlement. Unfortunately, they had arrived in December and were not prepared for the New England winter. However, they were aided by friendly Indians, who gave them food and showed them how to grow corn. When warm weather came, the colonists planted, fished, hunted, and prepared themselves for the next winter. After harvesting their 1st crop, they and their Indian friends celebrated the 1st Thanksgiving. My students also learned that the Pilgrims were persecuted in England for their religion, so they moved to Holland. They sailed on the Mayflower to America and wrote the Mayflower Compact. Times were rough, until they met Squanto. 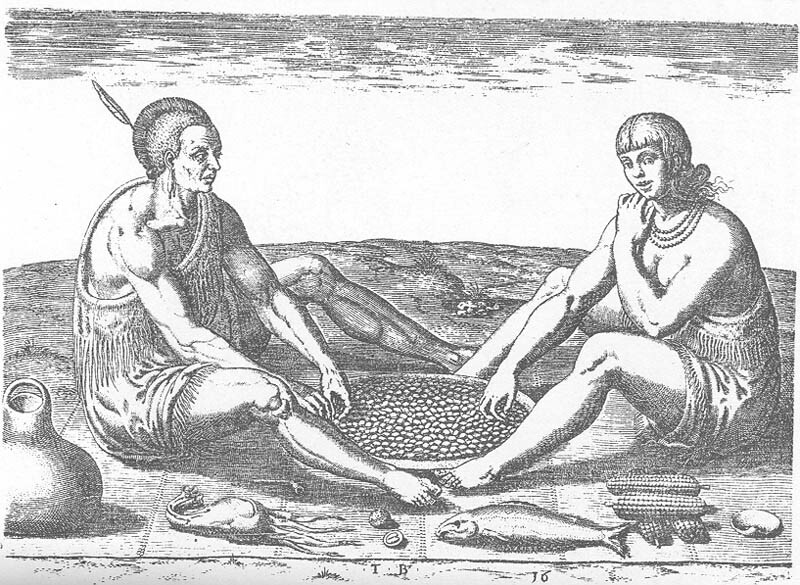 He taught them how to put fish in each corn hill, so they had a bountiful harvest. But when I ask them about the plague, they stare back at me. "What plague? The Black Plague?" No, that was 3 centuries earlier, I sigh. "THE WONDERFUL PLAGUE AMONG THE SAVAGES"
The Black Plague does provide a useful introduction, however. Black (or bubonic) Plague "was undoubtedly the worst disaster that has ever befallen mankind." In 3 years it killed 30% of the population of Europe. Catastrophic as it was, the disease itself comprised only part of the horror. Thinking the day of judgment was imminent, farmers failed to plant crops. Many people gave themselves over to alcohol. Civil and economic disruption may have caused as much death as the disease itself. For a variety of reasons --- their probable migration through cleansing Alaskan ice fields, better hygiene, no livestock or livestock-borne microbes --- Americans were... "a remarkable healthy race" before Columbus. Ironically, their very health now proved their undoing, for they had built up no resistance, genetically or through childhood diseases, to the microbes Europeans and Africans now brought them. In 1617, just before the Pilgrims landed, the process started in southern New England. A plague struck that made the Black Death pale by comparison. The summer after the Pilgrims landed, they sent 2 envoys on a diplomatic mission to treat with Massasoit, a famous Chief encamped some 40 miles away at what is now Warren, Rhode Island. The envoys discovered and described a scene of absolute havoc. Villages lay in ruins because there was no one to tend them. The ground was strewn with the skulls and the bones of thousands of Indians who had died and none was left to bury them. Many Indians likewise inferred that their God had abandoned them. Cushman, our British eyewitness, reported that "those that are left, have their courage much abated, and their countenance is dejected, and they seem as a people affrighted." After all, neither they nor the Pilgrims had access to the germ theory of disease. Indian healers offered no cure, their religion no explanation. That of the whites did. Like the Europeans 3 centuries before them, many Indians surrendered to alcohol or began to listen to Christianity. These epidemics constituted perhaps the most important single geopolitical event of the 1st 3rd of the 1600s, anywhere on the planet. They meant that the British would face no real Indian challenge for their 1st 50 years in America. Indeed, the plague helped cause the legendary warm reception Plymouth enjoyed in its 1st formative years from the Wampanoags. Massasoit needed to ally with the Pilgrims because the plague had so weakened his villages that he feared the Narragansetts to the west. Moreover, the New England plagues exemplify a process which antedated the Pilgrims and endures to this day. In 1492, more than 3,000,000 Indians lived on the island of Haiti. 40 years later, fewer than 300 remained. Europeans were never able to "settle" China, India, Indonesia, Japan, or most of Africa because too many people already lived there. Advantages in military and social technology would have enabled Europeans to dominate the Americas, as they eventually dominated China and Africa, but not to "settle" the New World. For that, the plague was required. Thus, except for the European (and African) invasion itself, the pestilence was surely the most important event in the history of America. What do we learn of all this in the 12 history textbooks I studied? 3 offer some treatment of Indian disease as a factor in European colonization. LIFE AND LIBERTY does quite a good job. AMERICA PAST AND PRESENT supplies a fine analysis of the general impact of Indian disease in American history, though it leaves out the plague at Plymouth. THE AMERICAN WAY is the only text to draw the appropriate geopolitical inference about the importance of the Plymouth outbreak, but it never discusses Indian plagues anywhere else. Unfortunately, the remaining 9 books offer almost nothing. 2 totally omit the subject. Each of the other 7 furnishes only a fragment of a paragraph that does not even make it into the index, let alone into students' minds. Everyone knew all about the plague in colonial America. Even before the Mayflower sailed, King James of England gave thanks to "Almighty God in his great goodness and bounty towards us," for sending "this wonderful plague among the savages." Today it is no surprise that not one in a hundred of my college students has ever heard of the plague. Unless they read LIFE AND LIBERTY or PAST AND PRESENT, no student can come away from these books thinking of Indians as people who made an impact on North America, who lived here in considerable numbers, who settled, in short, and were then killed by disease or arms. Instead of the plague, our schoolbooks present the story of the Pilgrims as a heroic myth. Referring to "the little party" in their "small, storm-battered English vessel," their story line follows Perry Miller's use of a Puritan sermon title, ERRAND INTO THE WILDERNESS. AMERICAN ADVENTURES even titles its chapter about British settlement in North America "Opening the Wilderness." The imagery is right out of Star Trek: "to go boldly where none dared go before." 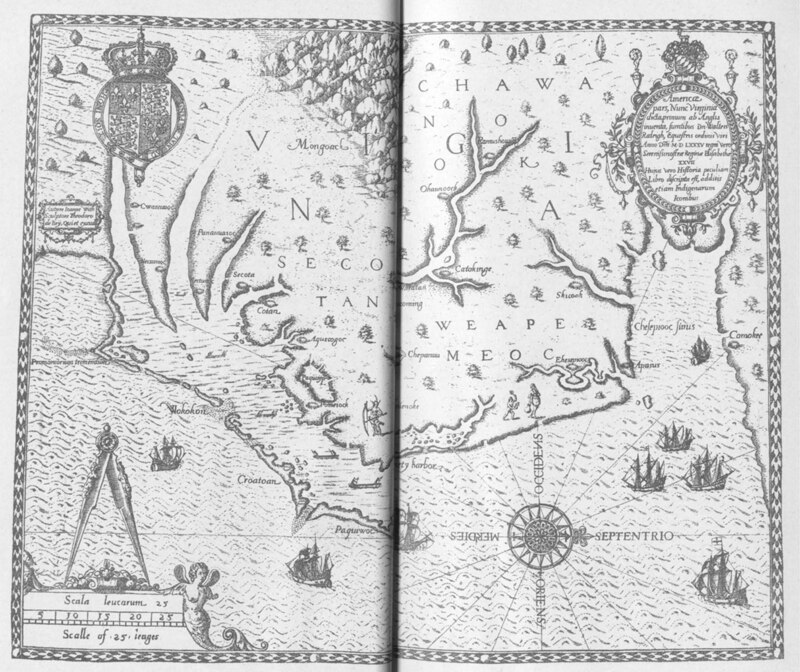 The Pilgrims had intended to go to Virginia, where there already was a British settlement, according to the texts, but "violent storms blew their ship off course," according to some texts, or else an "error in navigation" caused them to end up hundreds of miles to the north. In fact, we are not sure where the Pilgrims planned to go. According to George Willison, Pilgrim leaders never intended to settle in Virginia. They had debated the relative merits of Guiana versus Massachusetts precisely because they wanted to be far from Anglican control in Virginia. They knew quite a bit about Massachusetts, from Cape Cod's fine fishing to that "wonderful plague." 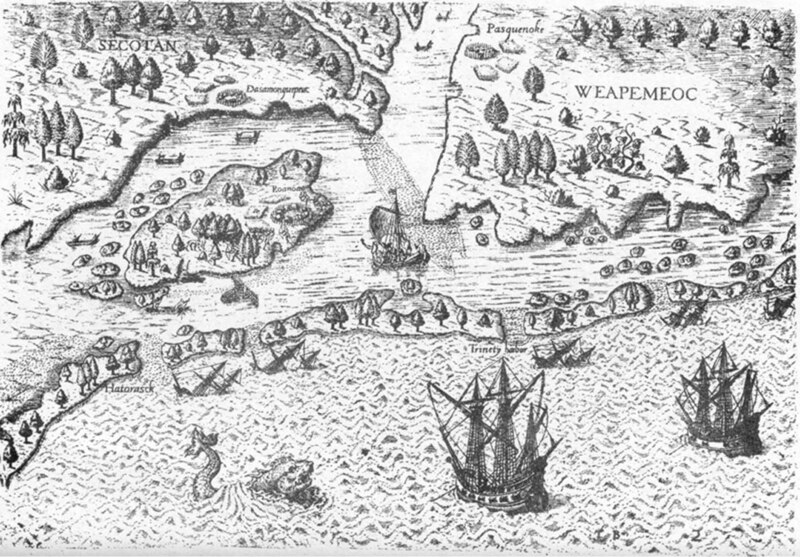 They brought with them maps drawn by Samuel Champlain when he toured the area in 1605 and a guidebook by John Smith, who had named it "New England" when he visited in 1614. One text, LAND OF PROMISE, follows Willison, pointing out that Pilgrims numbered only about 35 of the 102 settlers aboard the Mayflower. The rest were ordinary folk seeking their fortunes in the new Virginia colony. "The New England landing came as a rude surprise for the bedraggled and tired [non-Pilgrim] majority on board the Mayflower," says Promise. "Rumors of mutiny spread quickly." Promise then ties this unrest to the Mayflower Compact, giving its readers a uniquely fresh interpretation as to why the colonists adopted it. Each text offers just 1 of 3 reasons---storm, pilot error, or managerial hijacking--to explain how the Pilgrims ended up in Massachusetts. Neither here nor in any other historical controversy after 1620 can any of the 12 bear to admit that it does not know the answer---that studying history is not just learning answers--that history contains debates. Thus each book shuts students out from the intellectual excitement of the discipline. Instead, textbooks parade ethnocentric assertions about the Pilgrims as a flawless unprecedented band laying the foundations of our democracy. John Garraty presents the Compact this way in AMERICAN HISTORY: "So far as any record shows, this was the first time in human history that a group of people consciously created a government where none had existed before." Such accounts deny students the opportunity to see the Pilgrims as anything other than pious stereotypes. "IT WAS WITH GOD'S HELP...FOR HOW ELSE COULD WE HAVE DONE IT?" Settlement proceeded, not with God's help but with the Indians'. The Pilgrims chose Plymouth because of its cleared fields, recently planted in corn, "and a brook of fresh water [that] flowed into the harbor," in the words of TRIUMPH OF THE AMERICAN NATION. It was a lovely site for a town. Indeed, until the plague, it had been a town. Everywhere in the hemisphere, Europeans pitched camp right in the middle of native populations---Cuzco, Mexico City, Natchez, Chicago. Throughout New England, colonists appropriated Indian cornfields, which explains why so many town names---Marshfield, Springfield, Deerfield--end in "field". We marched to the place we called Cornhill, where we had found the corn before. At another place we had seen before, we dug and found some more corn, two or three baskets full, and a bag of beans. ..In all we had about ten bushels, which will be enough for seed. It was with God's help that we found this corn, for how else could we have done it, without meeting some Indians who might trouble us. ...The next morning, we found a place like a grave. We decided to dig it up. We found first a mat, and under that a fine bow...We also found bowls , trays, dishes, and things like that. We took several of the prettiest things to carry away with us, and covered the body up again. A place "like a grave!" More help came from a live Indian, Squanto. Here my students are on familiar turf, for they have all learned the Squanto legend. LAND OF PROMISE provides an archetypal account. Squanto had learned their language, the author explained, from English fishermen who ventured into the New England waters each summer. Squanto taught the Pilgrims how to plant corn, squash, and pumpkins. Would the small band of settlers have survived without Squanto's help? We cannot say. But by the fall of 1621, colonists and Indians could sit down to several days of feast and thanksgiving to God (later celebrated as the 1st Thanksgiving). What do the books leave out about Squanto? 1st, how he learned English. As a boy, along with four Penobscots, he was probably stolen by a British captain in about 1605 and taken to England. There he probably spent 9 years, 2 in the employ of a Plymouth merchant who later helped finance the Mayflower. At length, the merchant helped him arrange passage back to Massachusetts. He was to enjoy home life for less than 1 year, however. In 1614, a British slave raider seized him and 2 dozen fellow Indians and sold them into slavery in Malaga, Spain. Squanto escaped from slavery, escaped from Spain, made his way back to England, and in 1619 talked a ship captain into taking him along on his next trip to Cape Cod. It happens that Squanto's fabulous odyssey provides a "hook" into the plague story, a hook that our texts choose to ignore. For now Squanto walked to his home village, only to make the horrifying discovery that, in Simpson's words, "he was the sole member of his village still alive. All the others had perished in the epidemic 2 years before." No wonder he throws in his lot with the Pilgrims, who rename his village "Plymouth!" Now that is a story worth telling! Compare the pallid account in LAND OF PROMISE. "He had learned their language from English fishermen." What do we make of books that give us the unimportant details--Squanto's name, the occupation of his enslavers--while omitting not only his enslavement, but also the crucial fact of the plague? This is distortion on a grand scale. William Bradford praised Squanto for many services, including his "bring[ing] them to unknown places for their profit." "Their profit" was the primary reason most Mayflower colonists made the trip. It too came from the Indians, from the fur trade; Plymouth would never have paid for itself without it. Europeans had neither the skill nor the desire to "go boldly where none dared go before.|" They went to the Indians. "TRUTH SHOULD BE HELD SACRED, AT WHATEVER COST"
Should we teach these truths about Thanksgiving? Or, like our textbooks, should we look the other way? Again quoting LAND OF PROMISE. "By the fall of 1621, colonists and Indians could sit down to several days of feast and thanksgiving to God (later celebrated as the first Thanksgiving)." 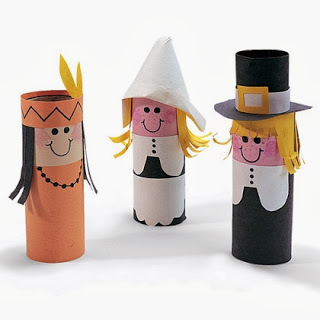 Throughout the nation, elementary school children still enact Thanksgiving every fall as our national origin myth, complete with Pilgrim hats made of construction paper and Indian braves with feathers in their hair. An early Massachusetts colonist, Colonel Thomas Aspinwall, advises us not to settle for this whitewash of feel - good - history. "It is painful to advert to these things. But our forefathers, though wise, pious, and sincere, were nevertheless, in respect to Christian charity, under a cloud; and, in history, truth should be held sacred, at whatever cost." Thanksgiving is full of embarrassing facts. The Pilgrims did not introduce the Native Americans to the tradition; Eastern Indians had observed autumnal harvest celebrations for centuries. Our modern celebrations date back only to 1863; not until the 1890s did the Pilgrims get included in the tradition; no one even called them "Pilgrims" until the 1870s. Plymouth Rock achieved iconographic status only in the 19th century, when some enterprising residents of the town moved it down to the water so its significance as the "holy soil" the Pilgrims first touched might seem more plausible. The Rock has become a shrine, the Mayflower Compact a sacred text, and our textbooks play the same function as the Anglican BOOK OF COMMON PRAYER, teaching us the rudiments of the civil religion of Thanksgiving. Indians are marginalized in this civic ritual. Our archetypal image of the 1st Thanksgiving portrays the groaning boards in the woods, with the Pilgrims in their starched Sunday best and the almost naked Indian guests. Thanksgiving silliness reaches some sort of zenith in the handouts that school children have carried home for decades, with captions like, "They served pumpkins and turkeys and corn and squash. The Indians had never seen such a feast!" When his son brought home this "information" from his New Hampshire elementary school, Native American novelist Michael Dorris pointed out "the Pilgrims had literally never seen`such a feast,' since all foods mentioned are exclusively indigenous to the Americas and had been provided by the local tribe." I do not read Aspinwall as suggesting a "bash the Pilgrims" interpretation, emphasizing only the bad parts. I have emphasized untoward details only because our histories have suppressed everything awkward for so long. The Pilgrims' courage in setting forth in the late fall to make their way on a continent new to them remains unsurpassed. In their 1st year, like the Indians, they suffered from diseases. Half of them died. The Pilgrims did not cause the plague and were as baffled as to its true origin as the stricken Indian villagers. Pilgrim-Indian relations began reasonably positively. Thus the antidote to feel-good history is not feel-bad history, but honest and inclusive history. 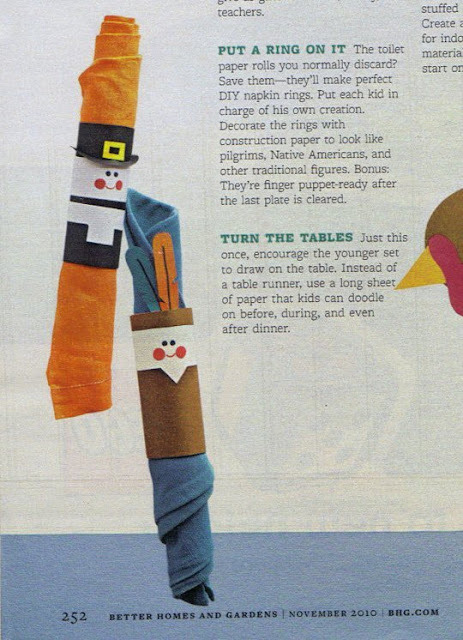 "Knowing the truth about Thanksgiving, both its proud and its shameful motivations and history, might well benefit contemporary children," suggests Dorris. "But the glib retelling of an ethnocentric and self-serving falsehood does no one any good." Because Thanksgiving has roots in both Anglo and Native cultures, and because of the interracial cooperation the 1st celebration enshrines, Thanksgiving might yet develop into a holiday that promotes tolerance and understanding. Its emphasis on Native foods provides a teachable moment, for natives of the Americas 1st developed 1/2 of the world's food crops. Texts could tell this--only 3 even mention Indian foods---and could also relate other contributions from Indian societies, from sports to political ideas. 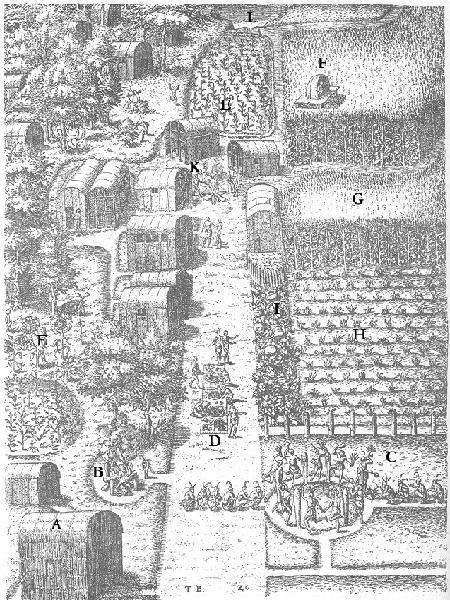 The original Thanksgiving itself provides an interesting example: the Natives and newcomers spent the better part of 3 days showing each other their various recreations. Origin myths do not come cheaply. To glorify the Pilgrims is dangerous. The genial omissions and false details our texts use to retail the Pilgrim legend promote Anglocentrism, which only handicaps us when dealing with all those whose culture is not Anglo. Surely, in history, "truth should be held sacred, at whatever cost."